These hotels and resorts can be sources of fun and enjoyment for the whole family, but there is always the need for you to be careful. An accident in any of these areas could sour that fun right away. Many of these fantastic hotels and resorts invite you in with a specific promise, one of safety. They bring you in happily with the assurance that you and your family are safe from harm, and that there is no need to worry while you’re here to vacation. Tourist or resident, you’re safe with them, but what if that’s not the case? What if you find yourself no longer safe due to no fault of your own, but due to the negligence of those that have promised your safety? A slip and fall seems like something that may not be serious. Your first instinct would most likely be to get up and move on without causing a fuss. The reality of the situation however is that the promise of reasonable safety that was given to you has been broken. Now you’re injured and trying to find out what the next step is. That’s where we come in. 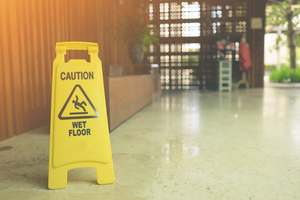 The law that a slip and fall accident can fall under is known as premises liability. That is when a person is injured in a public property that has a responsibility to keep the premises in a condition that does not invite accidents. Things like keeping the floor cleaned, repairing any damage from wear and tear, and ensuring that any cracked concrete within their property is properly paved and sealed. If any of these things are not taken care of, then that is a broken promise to you, the person now suffering from the negligence of others. The West Palm Beach slip and fall lawyers of Wolfson Law Firm are more than happy to get in contact with you over the nature of your accident, and to inform you if the case is worth pursuing. It’s only with decades of service and care that we’re able to properly evaluate each case given to us and inform our clients correctly as to what can be done. Trust is important in that aspect, you shouldn’t be run around by inexperienced or incompetent attorneys who’ll may only want to string you along. Our legal team will look over your case and tell you exactly what may fall under premises liability law and whether you may be entitled to compensation. The Wolfson Law Firm has been helping the good people of West Palm Beach and Florida at large for well over decades. Their service with personal injury and wrongful death claims makes them a valued source of information and work. Jonah Wolfson, the managing attorney of the firm, is a bilingual personal injury attorney with a legal team that is ready to speak to you. Calling at the toll-free number of 855-982-2067 for a free consultation is not only at no cost to you, but a responsible and effective move in being able to move on from the injury you suffered.